Hastings Ranch & Farm Fall Festival welcomes yet another exciting exhibitor to its upcoming Fall Festival which kicks off October 6th. The return of the Hastings Ranch & Farm Fall Festival being held in St. Cloud off of Narcoossee Road will once again entertain thousands of people every Saturday and Sunday in October. Chad Gainey will be featuring his amazing sculptures on the opening weekend. 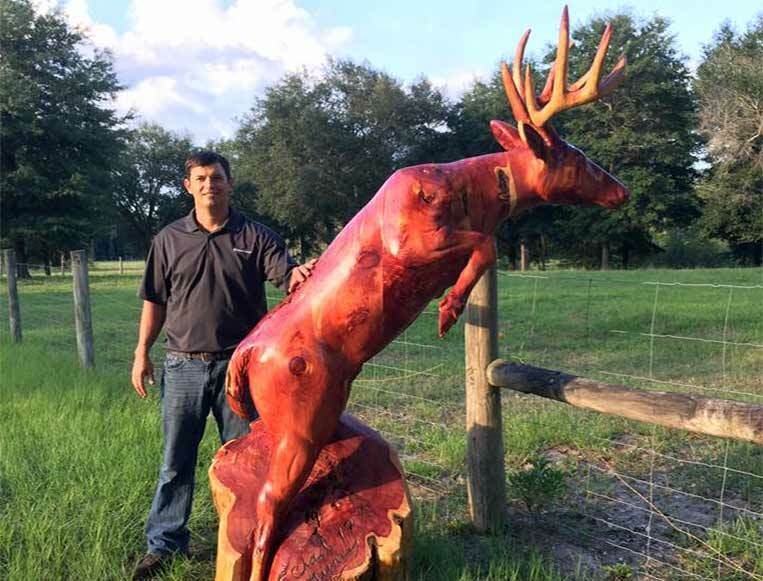 Chad Gainey first started his career in chainsaw sculpture in the spring of 2011 as a way to enjoy weekends with his family at the local farmers market. His first carvings were various tikis carved out of scrap logs because, as he says, “Tikis are supposed to look rough cut and, usually, the uglier, the better.” After a few weeks of selling tikis he started getting requests for saltwater fish and birds. This began a journey of discovering a hidden natural talent and, along the way, a new career path. Chad holds a Bachelors Degree in Agriculture Education from the University of Florida and spent several years teaching high school agriculture before making the transition to full time professional chainsaw artist after partnering with international power equipment manufacturer Husqvarna in early 2015. His carvings can currently be found all across the United States as well as Canada and Germany. He has been featured in various media outlets such as The Panama City News Herald, The Tennessean, Bay County Bullet, The Williamson Herald, WJHG Channel 7 News (Panama City), WMBB News Channel 13 (Panama City), and WKRN News 2 (Nashville). Save the date now, and come experience Chad Gainey’s Sculptures and much more!